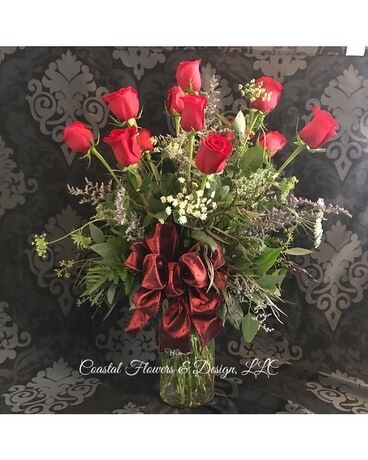 A classic dozen roses, Coastal Deluxe Style! We use multiple premium foliage's and premium accent flowers! These stunning Freedom Roses have been paired with seeded eucalyptus, lemon leaf, agonis, Queen Anne's Lace, caspia with jacquard ribbon. We can use any color rose you like! Just put your 1st choice color in the "Write a Note" portion of the checkout process! If no color is specified, the default color is red.